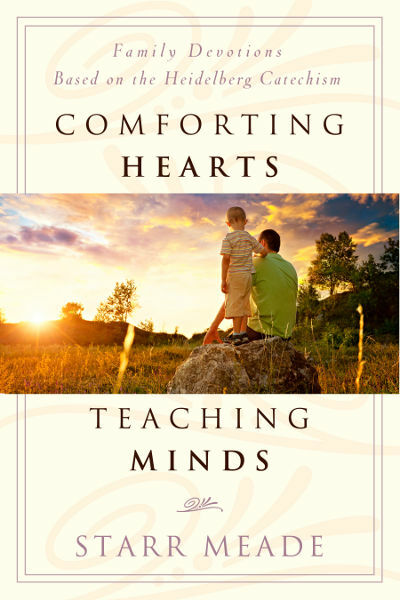 Comforting Hearts, Teaching Minds is a book of family devotions centered on the Heidelberg Catechism. If you are unfamiliar with this particular catechism you can learn more about it HERE. It is used primarily in reformed circles as a means of learning man's state as a sinner and his redemption in Christ. Originally written as a tool to promote unity, it was soon used as a teaching tool. There are 52 questions meant to be discussed and memorized over the course of one year. As Starr Meade points out in this devotional tool, some of the questions are pretty hefty and so the parent using this tool might want to consider spreading the material out for an extended period of time. Why use catechisms at all? They do seem like trite statements which you would memorize and spout off mindlessly. I know a lot of people dislike using prayer books because they feel that prepared prayers stifle prayer life and do not allow for spontaneity. However, just like a prayer book isn't supposed to be your entire prayer life, neither is a catechism supposed to be the whole of your faith. That said, it does provide a format by which one can learn and/or teach the basic tenants of the faith and that is why it is useful. "Our children face a future for which we must adequately prepare them. our children will encounter times when they will desperately need a deep and vigorous grasp of the truths of God's Word. They will face temptations and long to give in. They will confront of the horrors of a fallen world and question all they've been taught. They will know disappointment they will feel grief so profound that it consumes their desire to go on living; and they will ache with the weariness of staying strong day by day in the face of grinding routine. Why would we think that, in such demanding circumstances, our children will be able to live in the comfort God's Word provides if they have not trained for it? Why should we expect our children to remain rooted in the basics of the Christian faith if they do not know those basics well?" That fairly well summarizes why you might consider taking your children through a catechism, as it helps cement doctrinal truths into their minds in easy, concise statements. Devotionals like this one (and any other) should never ever replace the Bible or scripture memorization. If you are prioritizing correctly, the Bible should have your first and undivided attention! When push comes to shove, the living word of God is far more valuable and useful and we should be internalizing and memorizing it. However, if you have extra time and want to communicate and internalize certain doctrinal arguments and tenants of the faith then Comforting Hearts, Teaching Minds is a very useful tool and worth looking into. This book is divided into 52 individual devotions. There are 1-2 questions listed per Lord's Day with a week's worth of short devotions focused on explaining each question and answer. The devotions themselves are quite brief, being all of a paragraph or two in length. Each reading is simple in its explanations so that a child of three could easily comprehend it if you were willing to put the time and energy to it. And would it be worth it? That's for you and your family to decide! "A catechism cannot and should not replace Scripture. But it is an invaluable aid in summarizing and remembering the most important teaching of Scripture. Learning a catechism doesn't guarantee a child's conversion. Knowing truth well is not the same as responding to truth and living in the light of it. But our children cannot respond to truth they don't know. They can't live in the light of truth which which they are unfamiliar. Helping children to learn well the truth of Scripture is where we begin." Many thanks to P&R Publishing for sending a copy of this title my direction in exchange for my honest opinion. I personally find the book useful but I think it's up to each family to decide how they want to go about instructing their children in their faith (or any other subject, for that matter!). On Sundays we used to play games with our catechisms. We'd get a sticker on our catechism board for every one we had memorized, but when we were done memorizing them we'd play Pop Up for Pennies. I think we were responsible for the name, not my parents. We would sit on the floor and they'd ask a catechism question and whoever stood first got to answer, and got a penny. That was big money back in the day. Anyway, it was fun and it was a good way for us kids to get some basic building blocks for what we believed. We did the Children's catechism, and eventually the shorter catechism. We almost started the Heidelberg but never got around to it.